Several more Willesden riders completed their PBP qualifying rides yesterday (Sunday 29) by finishing the WCC 600km ‘Beast from the East’ from Waltham Abbey to Taunton and back, in under 40 hours. Well what else would they be doing on a bank holiday weekend? 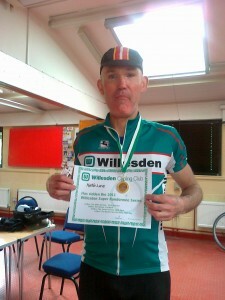 A strong Willesden field was led back by Martin Lucas, (seen here receiving his WCC Super Randonneur Series award) second rider to finish in 35hrs. Willesden’s Mike the Bike made sure all the riders got home by finishing last on the road. “I felt strong” said Mike as he inspected the mysterious chainring tattoos high up on his shorts at the finish. WELL DONE to all the riders, the impressive Willesden support crew, and of course the ride organiser – WCC’s very own Beast, Mark Brooking. Please may I have a copy of this photo for next week’s press report in the local?